This is my go-to meal lately! I have been eating it twice a week! I got the idea from Julie Hassan’s cookbook Vegan Pizza, but ended up changing it quite a bit to make it even work at all. So here is my version, adapted from her version. Add flour and salt to a bowl and stir together. Sprinkle the yeast evenly on the top. Add the rest of the ingredients and stir together with a fork until you can’t anymore. Use you hands if needed to form it into a ball. Cover the dough and let sit for at least 3-4 hours. You can refrigerate or freeze dough to use later. Blend all ingredients in a food processor or high speed blender until smooth. Wash the sweet potato and kale. Tear small pieces of kale away from the stems and pat dry with a clean towel. Peel the potato, and then peel off long slices of the potato for the pizza. Once your dough has risen, add some flour so it isn’t as sticky, as necessary. Roll out on pizza pan. I use a roller and my fingers. Cover with a thick layer of smokey cashew cheeze sauce (you may not use all of it, use your judgement). 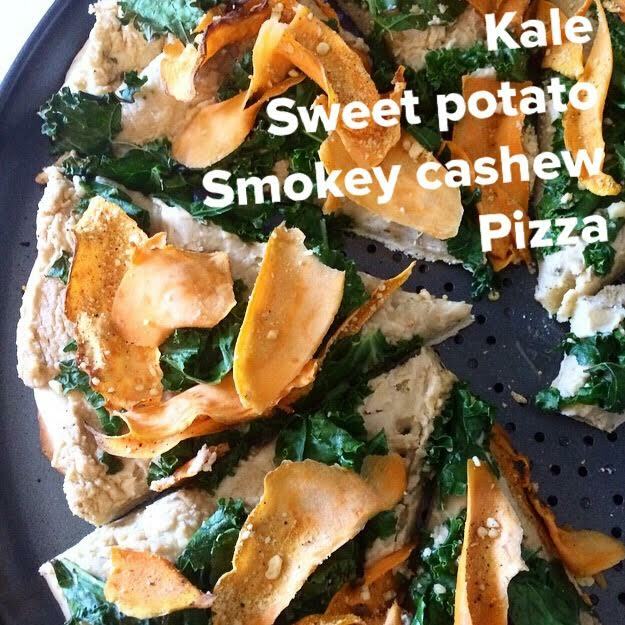 Place the kale on the pizza so it is as flat as possible, and really close together. Then add a layer of sweet potatoes so that the entire bed of kale is covered. Add some fresh cracked black pepper to the top. Sometimes I add some of Minimalist Baker’s Parmesan Cheese to the top (seen in pic). Place in the oven for 10-14 minutes. I usually do about 12-13 minutes, but all ovens are different. Watch it closely towards the end until the crust is a golden brown. Wait 5 minutes before cutting through the pizza to serve.